During the Han Dynasty (206BC-220AD), there was a county magistrate called Ying Chen. One summer day, he invited his secretary Du Xuan to his house and treated him to wine. On the north wall of the hall hung a red bow, which was reflected in Du Xuan's cup. Du Xuan took the reflection for a squirming snake. He was very frightened but dared not turn down Ying Chen's offer because Ying Chen was his superior. He swallowed the wine with his eyes closed. Back home, he felt so painful in his chest and stomach that he could hardly eat and drink anymore. He sent for the doctor and tried many medicines, but nothing could cure him. When Ying Chen came to Du Xuan's home and asked him how he became so ill, Du told him that he drank the wine with a snake in his cup the other day. Ying Chen felt so puzzled about that. He returned home and contemplated it but couldn't find an answer. Suddenly, the red bow on the north wall caught his eye. "That's it!" he shouted. He immediately sent his man to fetch Du Xuan. He seated Du Xuan where he sat before and offered him a cup of wine. Du Xuan saw the snake-like shadow again. 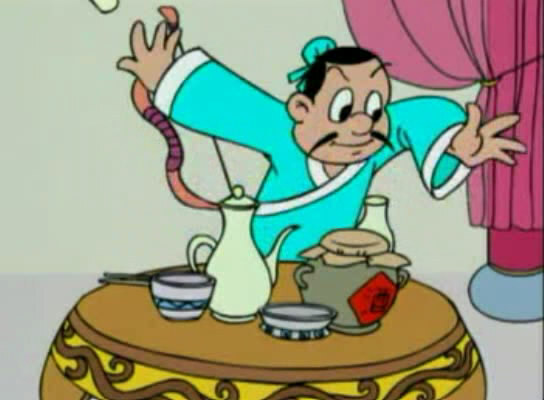 Before Du was scared out of his wits again, Ying Chen pointed at the shadow and said, "The 'snake' in the cup is nothing but a reflection of the bow on the north wall!" Now that Du Xuan knew what it was, he felt much easier. His illness disappeared the next moment! This story was later contracted into the idiom, "mistaking the reflection of a bow in the cup for a snake." We use it to describe someone who is very suspicious.